European Central Bank (ECB) president Mario Draghi sees no urgent need to cut the euro zone's main interest rate further and no signs of deflation, he said in an interview published on Saturday. While the euro zone crisis has not yet been beaten, there were many encouraging signs including economic recoveries in some countries, easing trade imbalances and shrinking budget deficits, he said. "That is more than we would have expected last year," he told German news magazine Spiegel. Asked about any further cuts to interest rates after the ECB cut its main refinancing rate to a record low of 0.25 per cent in November, Draghi said: "at the moment we don't see a need for any urgent action." The 66-year-old Italian who has led the ECB since 2011, said it was not "normal or healthy" for real interest rates, the rate savers receive after allowing for inflation, to be negative however. "In some countries they are negative, in others positive - even too high. We are very aware of the risks of this fragmentation." In November, annual rates of inflation in the euro zone ranged from -2.9 per cent in Greece to 1.6 per cent in Germany, according to European Union data. The risks of asset bubbles such as in some European property markets or the risk of falling prices were limited, he added. "We are not seeing any deflation at present... but we must take care that we don't have inflation stuck permanently below one percent and thereby slip into the danger zone." 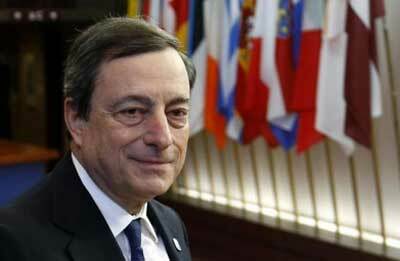 In Europe, markets expect inflation to rise to the ECB's target level of close to but below 2 per cent, he added.